Due to an overwhelming work load, we are now no longer able to carry out Customer Work in House but we can recommend Specialists who we use and therefore trust. Please give us a call to discuss. If you just need help, give us a call, we will do our best to help fellow enthusiasts and there will be no charge for advice, or call in for a chat and a coffee. That's part of what makes it fun! This 1949 Vincent Rapide was bought by us as a 'Chopper'. This is it it almost back to how it should be. All work including frame repairs were carried out by ourselves. Fortunately the previous owner kept most of the original parts so it wasn't as big a task as it might have been. BELOW:- This is a very rare (only 260 made) 1966 Triumph TR6SC West Coast. It was purchased as a box of bits although most were present. It was restored and assembled during late 2005 & early 2006 and sold immediately thereafter. A truly wonderful machine. BELOW:- This 1969 TR6 has been completely restored. Purchased as an unfinished project. 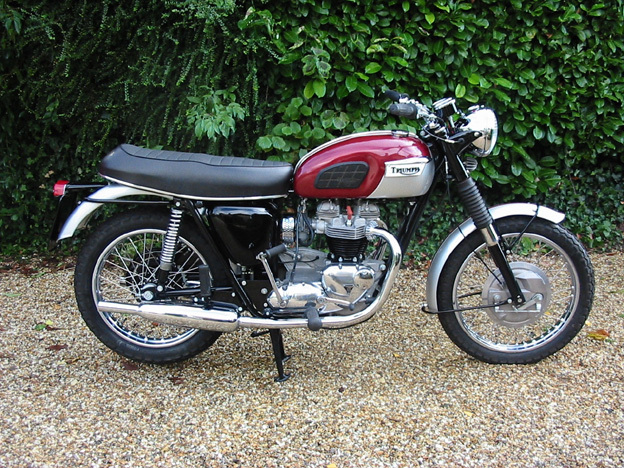 BELOW:- This is a Home market T120 fully restored by ourselves. Bought as a basket case with many parts missing or incorrect. Questions or problems regarding this web site should be directed to [c.spaett@virgin. net]. Copyright © 2002 [Venture Classics]. All rights reserved.